We have seen several different handmade doll lockers using cardboard boxes on blogs and Pinterest and knew we wanted to tackle the project at some point. We had the perfect sized box (actually one from American Girl!) and since we were playing school with the dolls already this weekend using the science set from Amanda we decided that this was the time to try to make them! We used this amazing tutorial from My Froggy Stuff. Instead of covering the entire box with duct tape though we opted to use the tape just around the edges of our locker and doors and we made a set of two lockers with doors that opened for both. Here are some of our photos from this project. First I penciled my lines on the box and cut the door openings. I then added some patterned paper to the rest of the box. Top, sides and on the front of the locker doors themselves. Zoey had some little AG paper die-cuts that we taped to the front of the box for some added team spirit. You could totally make your own little locker decorations. I used a marker to make the little slots and locker numbers suggested by My Froggy Stuff. Here is Zoe checking out her new locker! As you can see, they are not perfect but Zoe loves them and they are totally usable which is fun! Coats, backpacks, the dolls musical instruments will all fit inside the locker. Too cool! Thanks to My Froggy Stuff for the great tutorial! We love how our doll lockers turned out! Very nice! I love how they sparkle. Hello Jen! This is adorable! Thanks so much! I used one and it turned out awesome! I covered mine in duct tape all around! Hi! 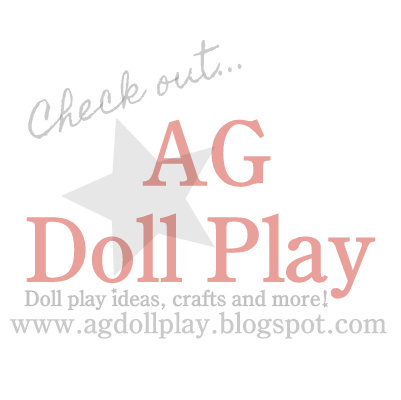 I've been looking at your blog and was wondering if you could do a room tour of zoey's americangirl doll room? love how you make it look so life-like! SO cool!